I don’t think many people remember what life was like in those days. This was the era when the Russians were claiming superiority, and they could make a pretty good case—they put up Sputnik in ’57; they had already sent men into space to orbit the earth. There was this fear that perhaps communism was the wave of the future. The astronauts, all of us, really believed we were locked in a battle of democracy versus communism, where the winner would dominate the world. As reported by Howard Wilkinson in 'John Glenn Had the Stuff U.S. Heroes are Made of', The Cincinnati Enquirer (20 Feb 2002). I will not go so far as to say that to construct a history of thought without profound study of the mathematical ideas of successive epochs is like omitting Hamlet from the play which is named after him. That would be claiming too much. But it is certainly analogous to cutting out the part of Ophelia. This simile is singularly exact. For Ophelia is quite essential to the play, she is very charming-and a little mad. Let us grant that the pursuit of mathematics is a divine madness of the human spirit, a refuge from the goading urgency of contingent happenings. In Science and the Modern World (1926), 31. It’s fine if you as an adult want to run around pretending or claiming that you don’t believe in evolution, but if we educate a generation of people who don’t believe in science, that’s a recipe for disaster. … The main idea in all of biology is evolution. To not teach it to our young people is wrong. 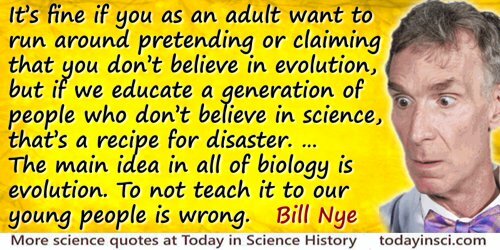 As quoted in Sarah Fecht, 'Science Guy Bill Nye Explains Why Evolution Belongs in Science Education', Popular Mechanics (4 Feb 2011). (1) No sea-creature is less than two inches long. (2) All sea-creatures have gills. These are both true of his catch, and he assumes tentatively that they will remain true however often he repeats it. In applying this analogy, the catch stands for the body of knowledge which constitutes physical science, and the net for the sensory and intellectual equipment which we use in obtaining it. The casting of the net corresponds to observation; for knowledge which has not been or could not be obtained by observation is not admitted into physical science. In 'Selective Subjectivism', The Philosophy of Physical Science (1938, 2012), 16. No engineer can go upon a new work and not find something peculiar, that will demand his careful reflection, and the deliberate consideration of any advice that he may receive; and nothing so fully reveals his incapacity as a pretentious assumption of knowledge, claiming to understand everything. In Railway Property: A Treatise on the Construction and Management of Railways (1866), 247. Rejoice when other scientists do not believe what you know to be true. It will give you extra time to work on it in peace. When they start claiming that they have discovered it before you, look for a new project. 'Resolution and Reconstitution of Biological Pathways from 1919 to 1984', Federation Proceedings (1983), 12, 2902. In The True Believer: Thoughts on the Nature of Mass Movements (1951), 14. Until now, physical theories have been regarded as merely models with approximately describe the reality of nature. As the models improve, so the fit between theory and reality gets closer. Some physicists are now claiming that supergravity is the reality, that the model and the real world are in mathematically perfect accord.